Today was an awesome day for NJD and me. After a leisurely breakfast with sweet Sakina and my weekend grocery shopping, I joined other Board members, Corvette drivers/owners at the Ibn Battuta Mall for our quarterly leisure drives that usually ends with a dinner at the Yas Island or Courtyard Mariott. In the past we have done mostly Abu Dhabi drives in conjunction with Road safety campaigns, no phones while driving campaign etc but today was a low key event which made it nice and cosy. 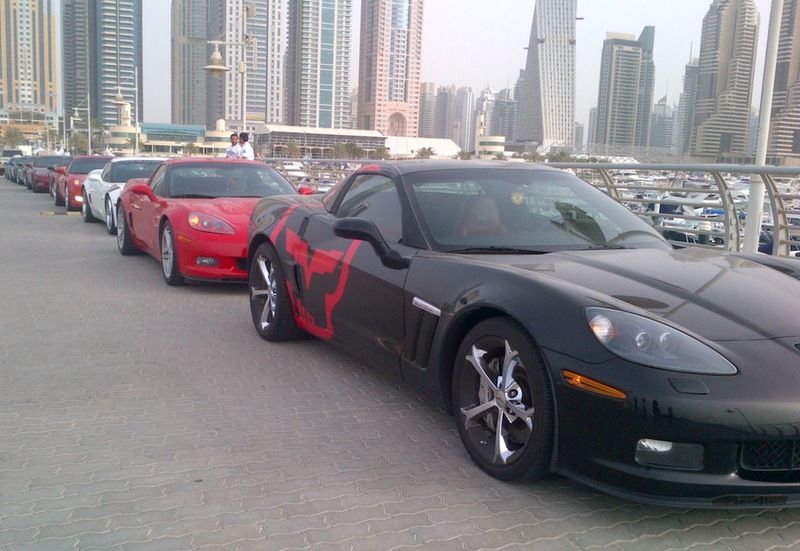 NJD joined Osama in his new black Corvette with red motifs while I joined Fahad in beautiful red one – I have to say we missed Hamad this time as I am usually his co-driver/passenger as well as our past race track driver Al Falasi, his wife Shamma and little Khalifa. Of all the leisure/networking groups I am a member of, I find CUC the most tight knit as a family…all the members watch out for each other and I’ve always felt super protected and respected with the same level of comfort I would have with my close family members. In that way it stands out hence the reason I make extra effort to be part of the Club’s events. Today we skipped having police escorts we normally arrange so the route was a lot more flexible. We had fun at Atlantis as the entourage became the hottest attraction amongst the throng of weekend visitors and tourists who became camera happy as the cars passed by. We toured to Madinat after Atlantis and then to Dubai Marine International Club where a photoshoot of the cars/members took place against the backdrop of yachts and the clear blue waters of Dubai. At DIMC, a London chick started jumping up and down as I got out of the car to pick NJD and she started screaming she had never seen so many nice cars all at once and almost mobbed me. It was a hilarious sight and it took me a while to realise she was probably a newbie in Dubai who in a Barasti influenced mellow state got a bit overwhelmed seeing so many Corvettes in one place and wanted to be friends + go for a ‘drink’. (I can be ‘duh’ at times). Naturally I didn’t have the heart to tell her she didn’t remotely come close to the quality of friends I would choose to be associated with and I certainly didn’t wanna hang out with her at Barasti with my child – first impressions do count! Anyway, thanks to Christian, a superb chef and one of our members since we first began, the drive finished at Courtyard Marriott with a dinner that was organised by Christian’s team. I skipped dinner for another event that in true diva style I overlooked in favour of Russell Peters & Once upon a time. (I am becoming a TV series addict in my old age). I’m sure I’ll go to bed smiling today as I had an awesome time with Sakina, NJD, old friends from the Corvette family and packing in loads of laughs from Russell Peters with a bit of fairy tale drama. And it feels awesome to be part of a club that started out as a CSR initiative to educate super car owners on safe driving, be part of events for children with special needs and in the process has become part of a family where members look out for each other. CUC is yet another reason why I love being in the UAE so much.